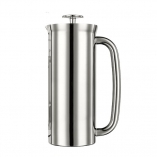 Durable, compact, and oh so perfect for tea infusing. This classically designed tea ball allows you to steep loose leaf tea to your personal taste. Like a little gem, this tamper has a clear acrylic accent and 18/8 stainless steel body. 49mm dia., flat bottom. 18/8 stainless steel mesh. Dishwasher safe. Makes up to 2 cups. A double ended spoon finished in striking gun metal. 15ml and 30ml measuring sides, this tool will look great at your espresso bar! A double ended spoon finished in striking electric copper. 15ml and 30ml measuring sides, this tool will look great at your espresso bar! These stencils are fun and easy to use. Shake decadent cocoa on top of a latte and show everyone your coffee is made with love!